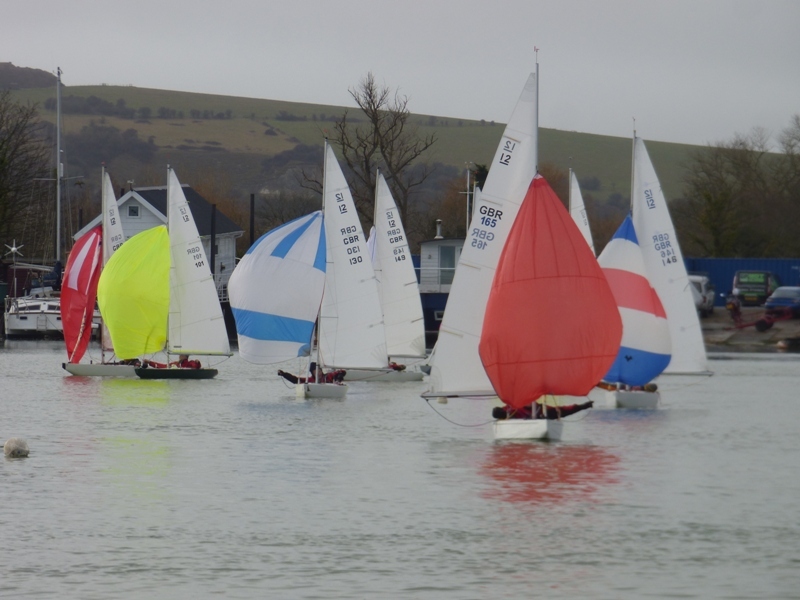 Although not really needed on Saturday as there were only spots of rain, a waterproof jacket was certainly required on Sunday in the steady drizzle – very apt given that it was the January Jacket Regatta over the weekend! After a short postponement waiting for the twelve Illusions to make their way down the harbour to the start line, the first race in a light SW’erly breeze saw Mark Downer and Mike Toogood over cooking it and having to extract themselves from the middle of the line to return after being called OCS. Bill Daniels was first round the windward mark closely pursued by Raymond Simonds, Steve Warren-Smith and Philip Bown. As the race unfolded Bill extended his lead and although he looked safe, he was nonetheless very relieved when the Race Officers decided to finish the race after only two rounds. 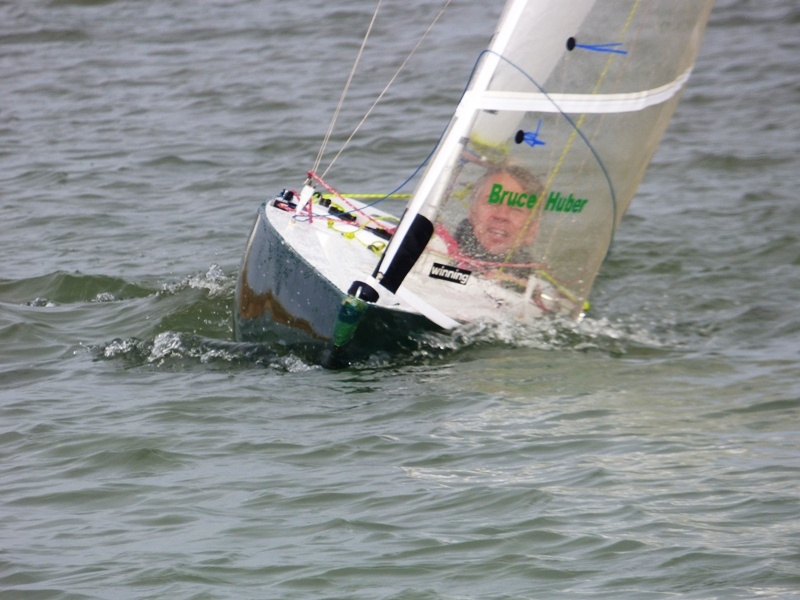 During the second round, Bruce Huber moved up into third place and by the time he and Raymond rounded the leeward gate they were neck and neck; indeed at the finish they could not be split so were scored second equal. Philip was fourth. The start of the second race was extremely close with Bruce mere centimeters from being OCS. 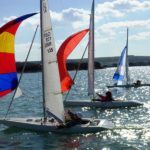 With split tacks to the windward marks, it was Mark’s pink spinnaker that was first to appear, closely followed by Raymond’s red and Bill’s white spinnakers. Mark extended his lead over the next two rounds and finished well ahead. On the second run Bruce and Raymond had some close racing with a number of vocal exchanges as they ran towards the leeward gate, however in the third round Bruce missed the best wind shifts and could only watch Raymond & Bill move ahead of him to take second & third. Indeed on the final beat back to the line it was Steve Warren-Smith who took fourth place inches ahead of Bruce. The start of the third race probably should have been a General Recall, however the three obvious boats OCS, Mark, Bruce and Rupert Holmes (who had joined in time for the second race) all came back correctly so it was no surprise to see Raymond first round the windward mark. It was good to then see Mike Toogood with Steve Warren-Smith not far behind. On the second and third rounds, Raymond extended his lead and although Mike managed to hold onto second place, Steve was relegated to fifth place when Bruce & Mark overtook him towards the end of the race. 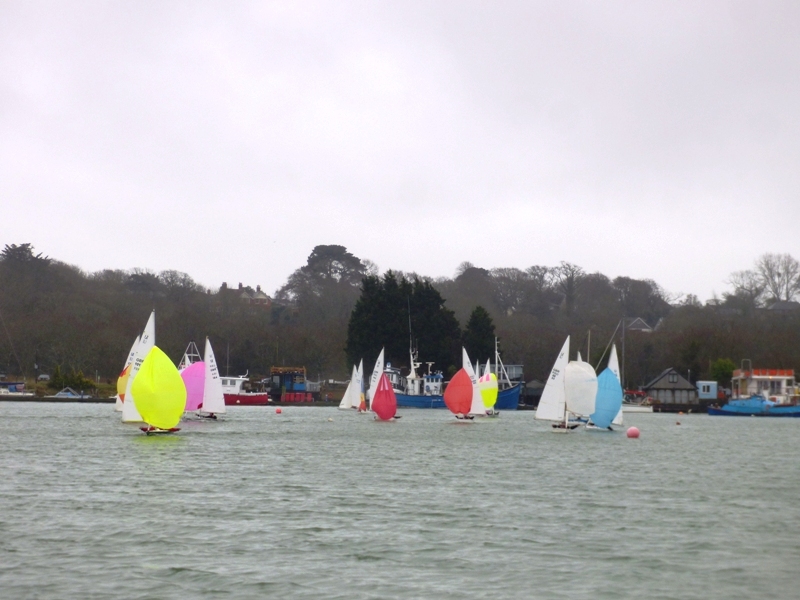 With strong winds and heavy rain forecast for the following day, it was decided to have a fourth race. With the sun making a brief appearance, the start was the best of the day. Raymond was first to the windward mark with Bruce & Mark hot on his heels. By the time they crossed the line to start the second round, Raymond was back in third and although a couple of misread windshifts would have changed things, Bruce managed to keep Mark at bey and so took first place. Fourth was Rupert who had had a close tussle with Bill. 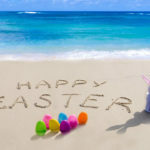 Sunday’s forecast was still showing the wind increasing during the early afternoon, so it was with some trepidation that some of the less experienced took to the water. 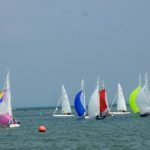 Although five from the day before did not race, there were seven who had not raced, so the first race of the day got underway with fifteen boats vying for a place on the line. With the light breeze oscillating between South & South East, the Race Officers had quite a problem with the course; although there were no trot moorings to worry about the mid-harbour pontoons meant that there was little opportunity to tweak things. Indeed, it was made even harder when it became clear that the Committee Boat anchor had snagged on one of the trot mooring ground chains so could not move. Despite this the first race got away to a clean start (just); first to the windward mark was David Russell-Jones who managed to hang onto his lead on the run to the leeward gate, however on the second round he was overtaken by an ecstatic Justin Biddle and in the third round by Bruce & Mark so he had to make do with a fourth. 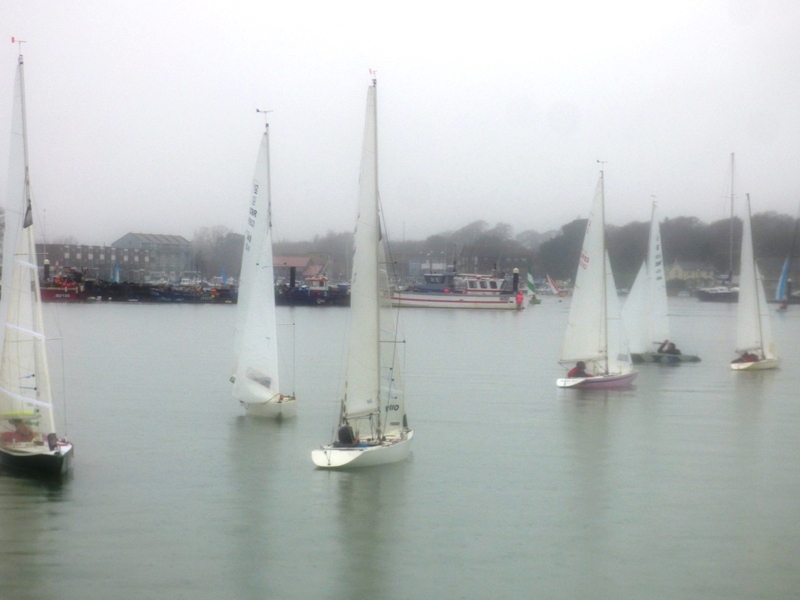 With the drizzle making everything on the Committee Boat very damp and the fickle breeze coming and going, the sixth race saw the 1st Sub displayed and the fleet recalled. The second start was under the Black Flag and went off without any further problems. George Downer, timing his run in to the line on port at the pin end perfectly, was the early leader, however as the race progressed he was overtaken by Raymond who then built up a nice lead. George and Bill had a close battle for second and third, as did Mark, Justin, David & Bruce for the next four places. 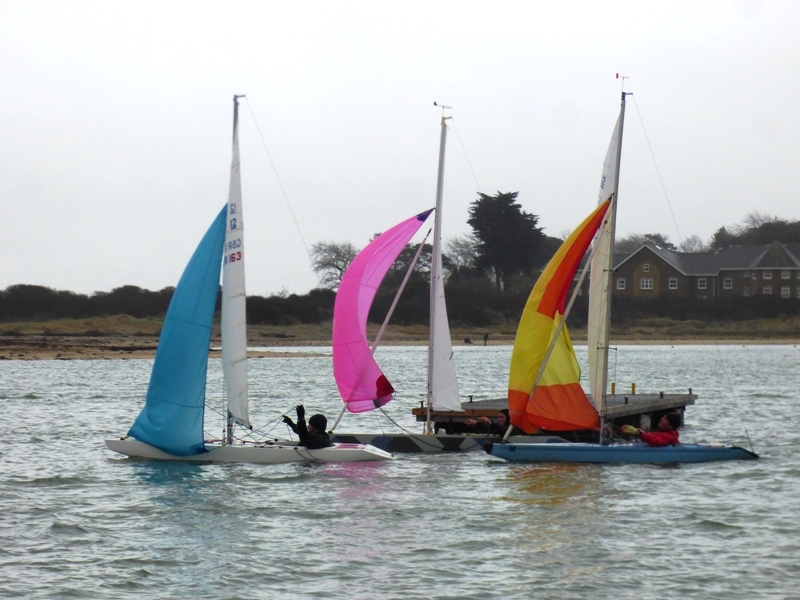 With light breeze backing to the South East and looking as if it would hold, the course was quickly re-set and slightly surprisingly got away to a clean start. The fleet initially made reasonable progress to the extended windward marks and so things were looking good for a close race. However, instead of increasing as forecast, the breeze dropped and left most of the fleet becalmed. Those at the front, lead by Raymond, decided to continue while those at the back wisely decided to call it a day. With it looking unlikely at one stage that even a one round race was going to be possible, Raymond, Justin and David persevered and took the first three places. A delighted Andy Christie nearly beat Bruce into fourth and finished ahead of Mark. No racing next weekend as the tides a wrong. 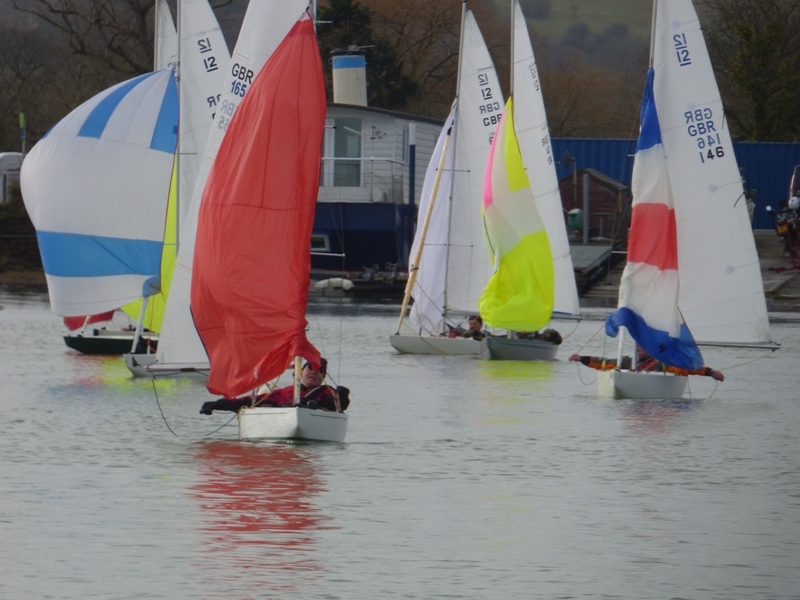 The following weekend (3rd & 4th February) is the Valentine Trophy with starts at 11:30 & 12:00 respectively.